I have always have to have an elastic on my wrist. I barely ever use it but it's my security blanket. If my hair gets frizzy, it's there. When I lived in Vegas, a girl once asked if she could pay me $20 for my rubber band because she was in dire need of it (we were at a pool party on a hot Vegas night). As crazy as it sounds, I almost denied her because I felt so weird without it. But I took the $20 and survived! (I know, I should have just given it to her, but she offered!!) As much as I need an elastic on my wrist at all times, I also hate them. They never go with my outfits and they sort of have a juvenile look (says the lady who shops in the kids department). 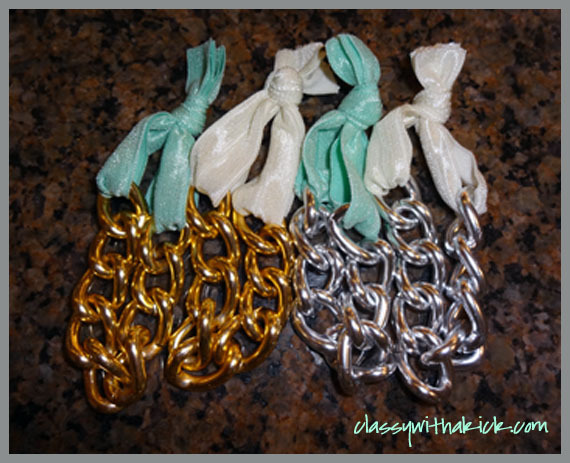 Anyway, while I was creating my first few versions of my lace necklaces, I had some small pieces of chain leftover. 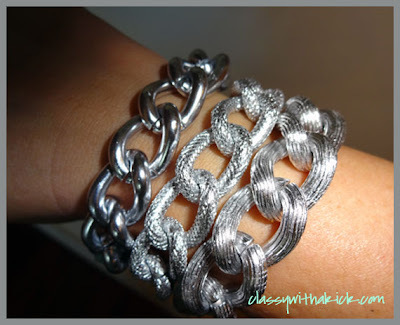 I was thinking about what to do with it when I thought - hey, make a bracelet - since I love stacking bracelets. However, the pieces were too short to go all the way around my wrist. I thought about adding a ribbon to tie it together but having to tie the ribbon each time to put it on would be a pain. 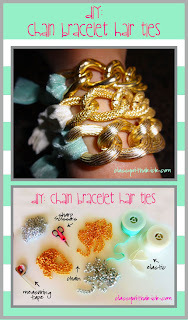 But then, I had the genius idea to use an elastic and voila - chain bracelet hair ties were invented! Chain - You want a somewhat substantial chain - like a 10+ mm. You can find this at many fabric stores or you can order them online. Foldover Elastic - You can find this at ANY fabric store. It's the same stuff that Anthorpologie uses in their hair ties! Measuring tape - Use this to measure the elastic. I use about 14 inches per tie/chain. 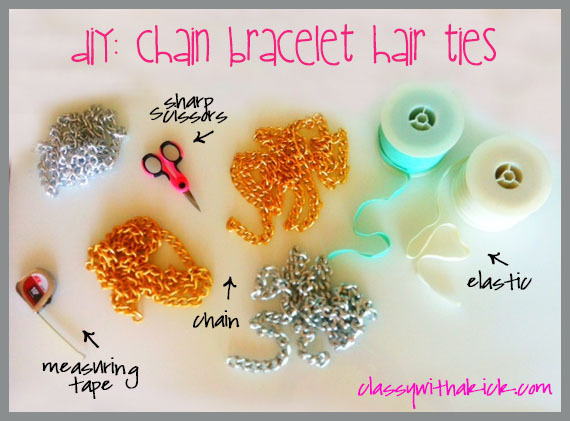 It gives you room to tie and cut the ends evenly. Scissors - you can figure it out...to cut the elastic! Make sure they are sharp b/c the elastic can snag and fray! That's it. 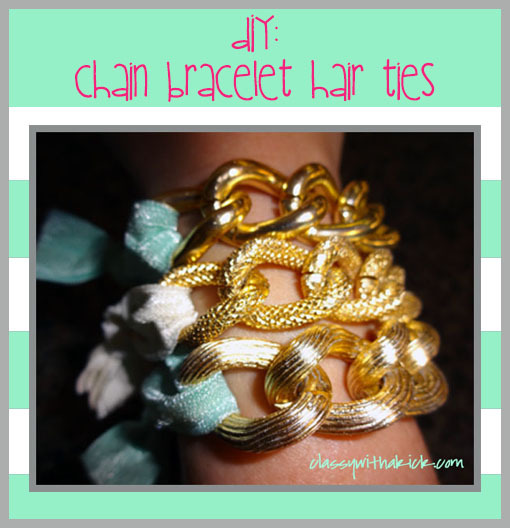 Measure your chain, tie your elastic and sport your arm candy / chic hair tie! 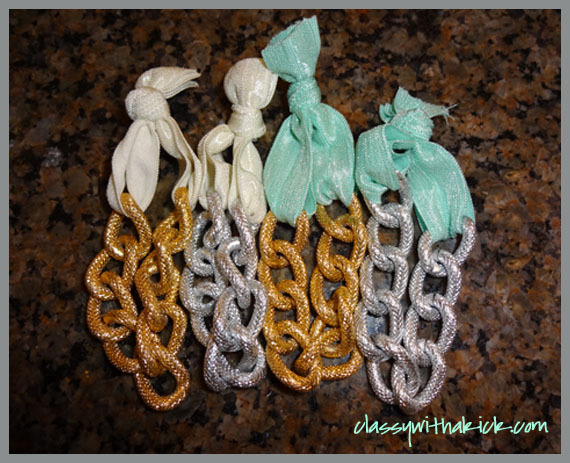 No more wearing random rubber bands for me...you would almost never know these were hair ties! Right?? The best part, you can stack them or wear them individually. They look great with other bangles or on their own. I think they look awesome with an oversized watch and some enamel or crystal bangles. I'm so going to try and create this! You just gained a new follower! Yay! I am glad. Let me know how it goes! :) Excited to check out your blog too! I have been looking for chain on line for such a long time! Did you get yours from a fabric store and if so, which one? Or on line? If on line, would you mind telling me what website? I would be very greatful. Hi! I got mine at a local store here in San Diego, but there are TONS of places online to buy in bulk. One of my favorite is Fire Mountain Beads. They have pretty much everything. 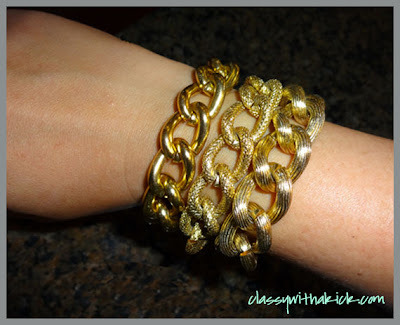 But if you do a search for bulk jewelry chain, you can have your pick! Good luck! Hey, i just saw your link in the members directory of IFB and really love this DIY, i`m going to make it very soon.